Before I start this post, I first want to apologize for the long delay between posts. 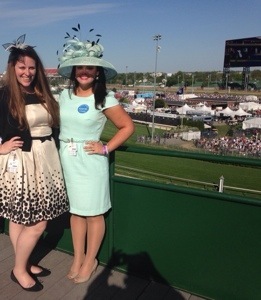 I have been very busy the last couple weeks as I have been working at Churchill Downs during the recent Kentucky Derby. 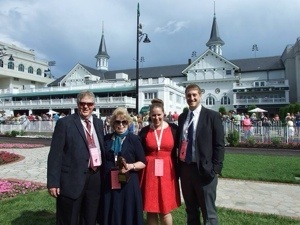 It was a lot of work but also a lot of fun (as you can see here: The 140th Running of the Kentucky Oaks and the Kentucky Derby). I am glad to have some free time back to do some cooking and blogging though. 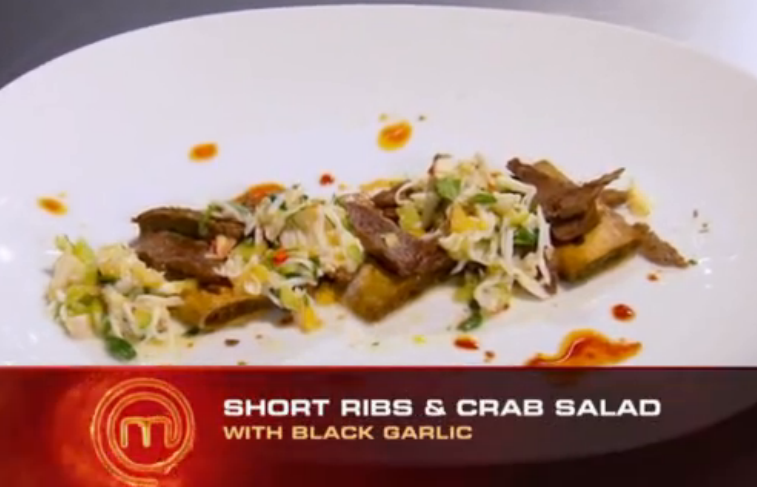 As the winner of the mystery box challenge, Adrien was able to choose between three of Joe’s favorite ingredients: Octopus, Veal and Mushrooms. He chose octopus for himself. 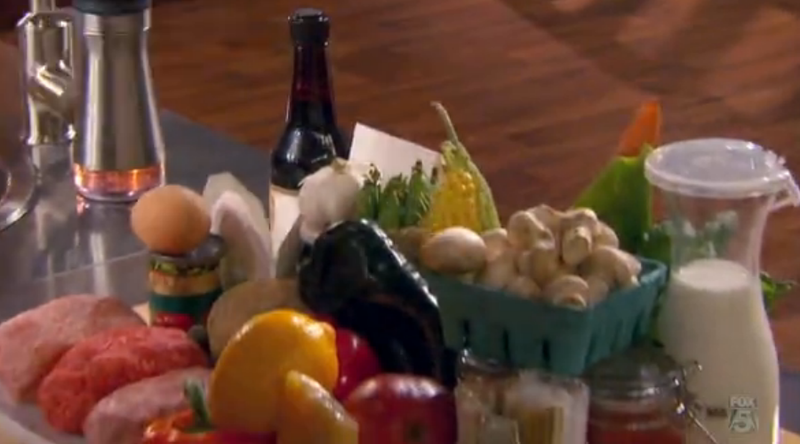 Then, Christian was able to select his and Jennifer’s ingredient. Christian selected veal for himself and gave Jennifer mushrooms to work with. 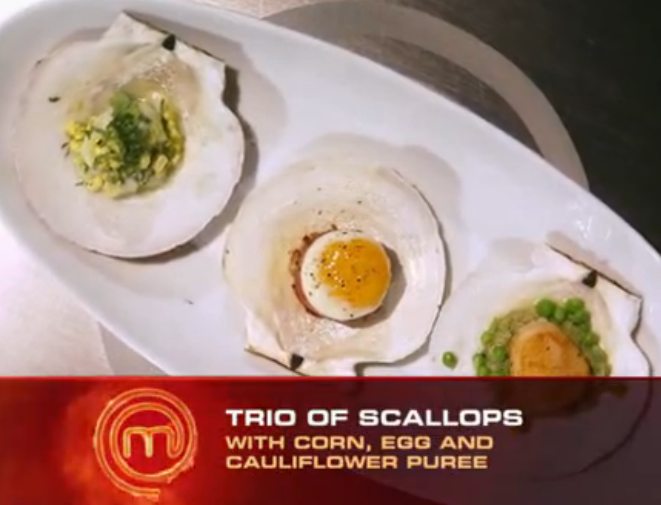 Each contestant had positives and negatives to their final dishes, but the judges decided to send Adrien (Pan Seared Octopus) and Jennifer (Mushroom and Egg Ravioli) to the Final Challenge. 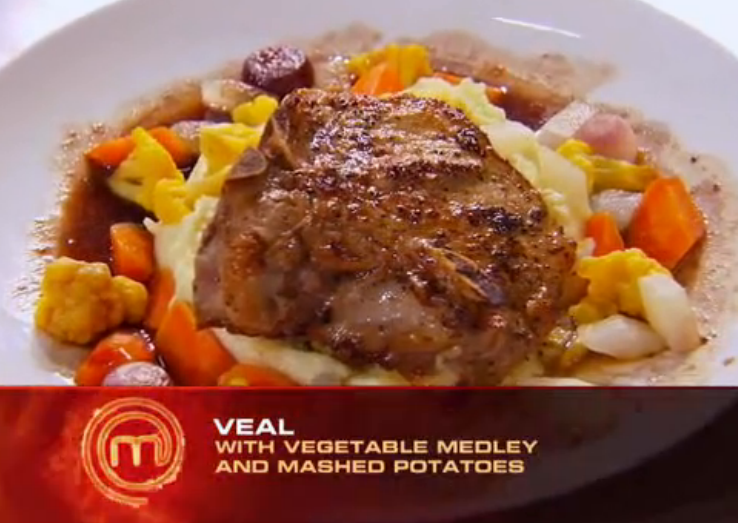 This eliminated Christian (Veal) from the competition. 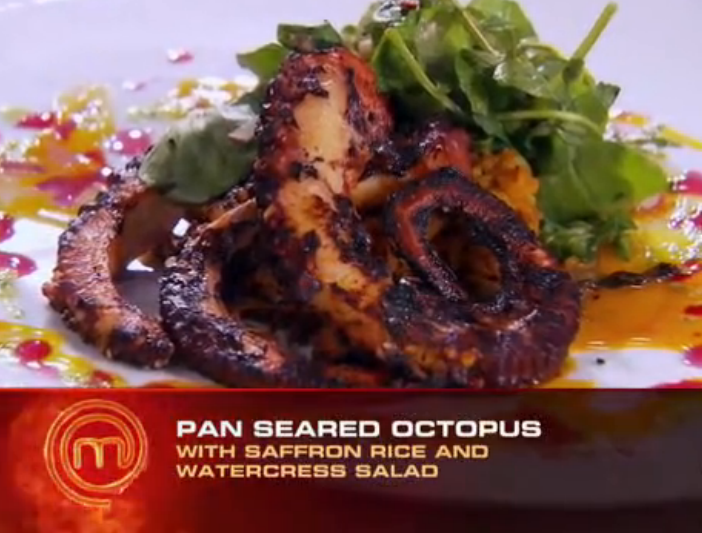 However, for this challenge, if I were to follow this rule, I would have to cook with octopus. While I would love to tackle the challenge, I know that I am just not going to be able to find octopus to work with. 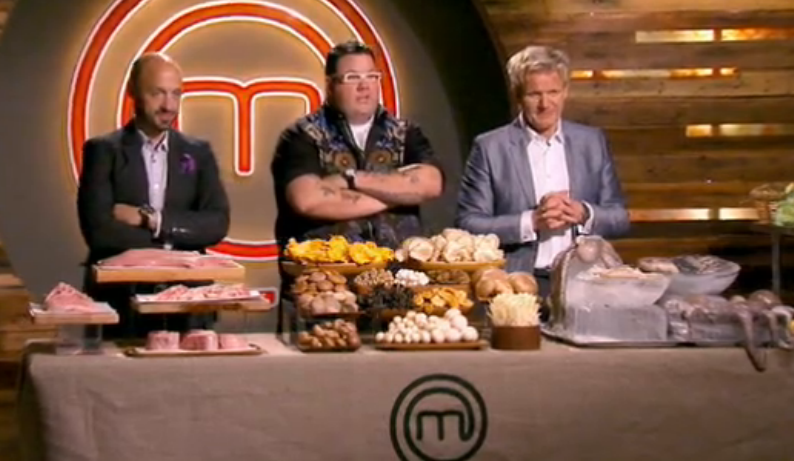 So to try and follow the rule at least a little bit, I will cook with the ingredient given to the challenge’s “target.” That ended up being Jennifer, who was stuck with mushrooms. I knew I wanted to try something a little different and crepes have been on my list of “dishes to attempt.” I was lucky enough to find this recipe that met both criteria: Mushroom Crepes with Poblano Chile Sauce. Since most of this was new to me, I mostly stuck to the recipe with the one exception being my addition of chicken. 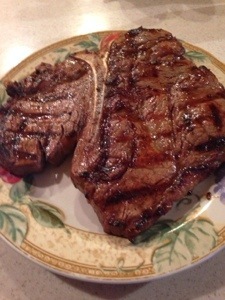 This was going to be my dinner, after all, and I wanted protein! 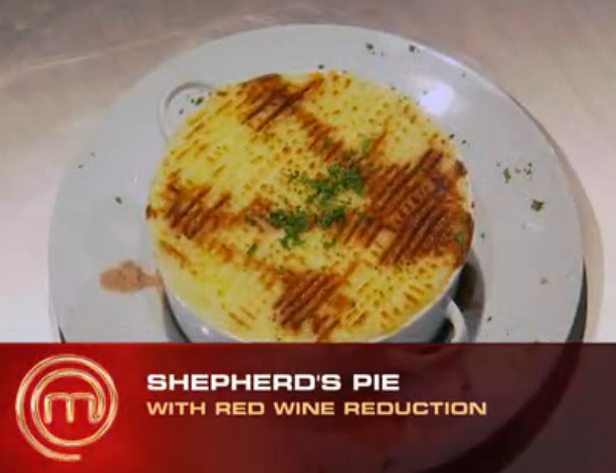 However, this dish would be just a delicious as the original vegetarian option. I also halved the recipe to make only 8 crepes, which brought down the expected cook and prep time of 4 hours to just under 3 hours. 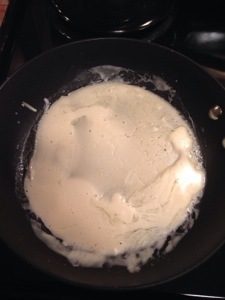 The first thing I did was make the crepe batter. 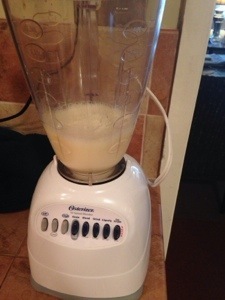 I blended 1 cup of whole milk, 1.5 eggs (I guesstimated this – I know its a weird amount but that’s what happens when you only do half of a recipe), 1 tablespoon of melted butter (that had been cooled), and 1/2 of a teaspoon of fine sea salt in a blender for 5 seconds. 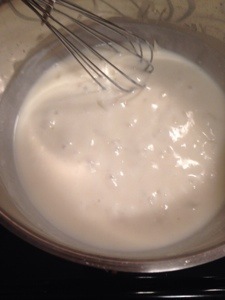 I then added 1 cup of flour, 1/2 cup at a time, blending the batter until it was smooth after each addition. I let this rest for 1 hour and then re-blended for 5 seconds just before using. While the batter was resting, I started to prep some of the other components. First, I charred 3 poblano chiles in the broiler until they were blackened on all sides. I then enclosed them in paper bag for 10 minutes. 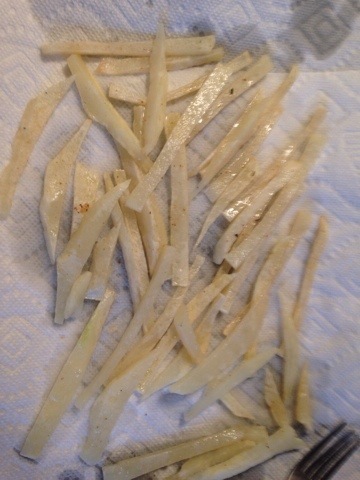 Finally, I peeled, seeded, and thinly sliced the chiles. 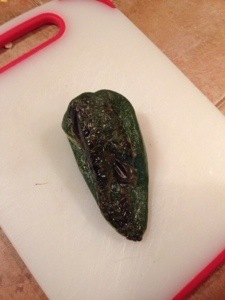 For this part of the recipe, I used this tutorial as a guide: How to Roast and Peel Poblano Peppers. 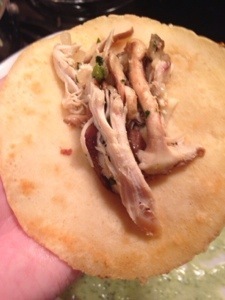 Next, I prepped the other ingredients: diced white onions, minced garlic, minced cilantro, sweet corn sliced off the cob, and shredded chicken (I cheated and just got the pre-cooked rotisserie chicken from the grocery store). All of these were fairly simple but I decided to use this post as an excuse to try this: The Magic Corn Trick. 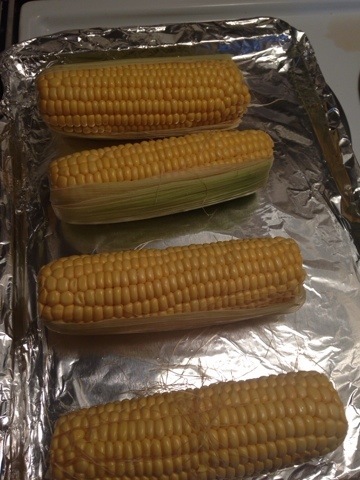 While it worked really well for cooking the corn, the cob didn’t exactly slide out without any silk. Maybe I needed to cook it longer or maybe I needed to trim it more. Either way, there was something there that didn’t quite work but I’ll definitely try it again sometime. After all the prep work was done, I moved on to the crepe making. I heated a medium nonstick skillet over medium heat. I brushed the bottom of the pan with melted butter. 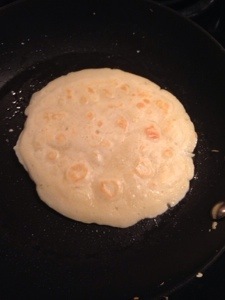 Then, I poured 3 tablespoons of batter into the skillet and swirled until the bottom of the skillet was coated evenly. I let this cook until the bottom of crepe was golden. (The recipe said that this should take about 30 seconds but it took much longer than that). 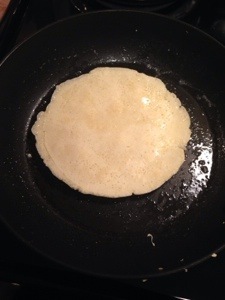 Then, I loosened the edges gently with a spatula and turned the crepe over. 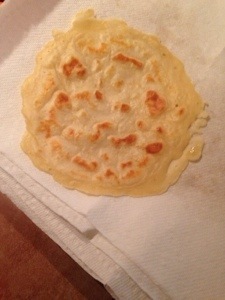 I cooked this until the bottom was brown in spots, and turned the crepe out onto a paper towel. 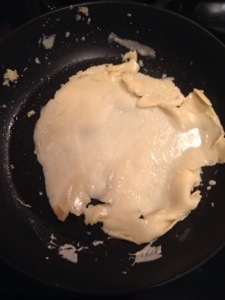 The first crepe I made was a disaster. It wasn’t really cooking all that well and I turned it too early so it looked completely screwed up (as seen below). But I turned the heat up and got the hang of the cooking process on the second one and it only got better from there. I repeated the cooking process for each, making about 8 crepes (plus the one wonky crepe) and stacked them between paper towels. 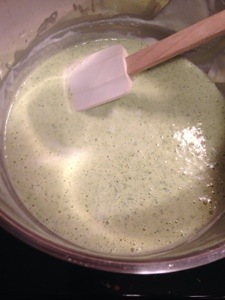 Next, I moved on to the poblano cream sauce. I melted butter in a medium saucepan over medium heat. 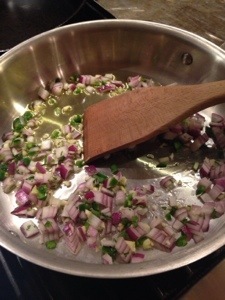 I then added 2-3 tablespoons of diced white onion and 1 clove of minced garlic, and sautéed for about 2 minutes. 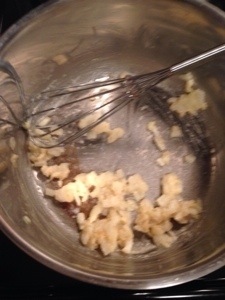 Next, I stirred in 1 and 1/2 tablespoons of flour and sautéed for 1 minute longer. 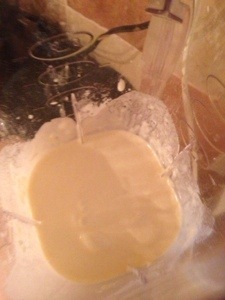 I then whisked in 1 cup of warm whole milk and brought the whole mixture to a boil (while whisking constantly). 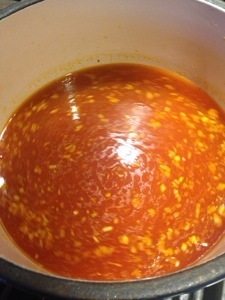 I reduced the heat to medium-low and let the sauce simmer until it thickened, about 5 minutes. 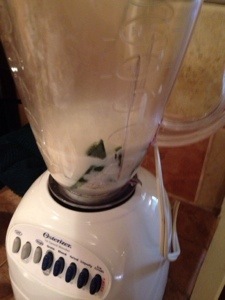 Then, I poured the sauce into a blender with 1/4 cup of heavy whipping cream, half of the roasted poblano chiles, and salt and pepper to taste, and blended the sauce until it was smooth. After completing the sauce, I moved on to the filling. I heated a few tablespoons of olive oil in a large skillet over medium-high heat. I then added 1 cup of diced white onions, 8 ounces of sliced shitake mushrooms, 3-4 cloves of minced garlic, and half of the reserved poblano chiles (chopped). 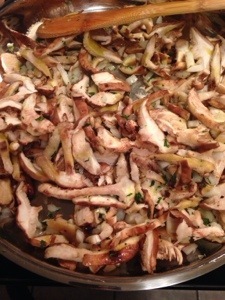 I sautéed this until the mushrooms were brown and the mushroom liquid had evaporated, about 10 minutes. 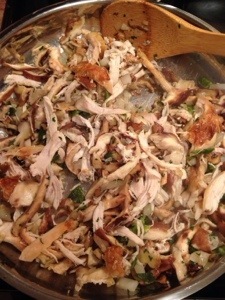 Then, I added the shredded chicken, 1 tablespoon of minced fresh cilantro and salt and pepper to taste. 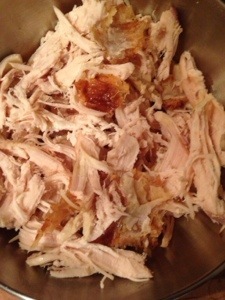 I let that mixture cook together until the chicken was warmed through. 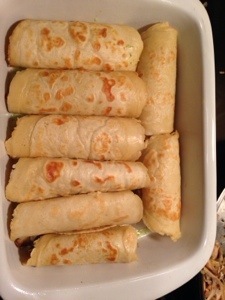 With most of the components finished, I then started to fill the crepes. 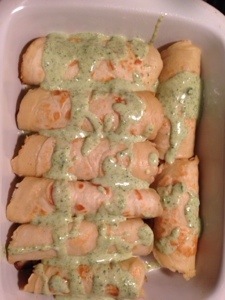 I spooned some of the filling in the middle of the crepe, wrapped it and placed it in a baking dish. I drizzled about half of the poblano cream sauce over the top of the crepes, and then sprinkled 1/2 of a cup of grated manchego cheese over top. I put this dish in a 350-degree oven until the cheese melted, about 12 minutes. 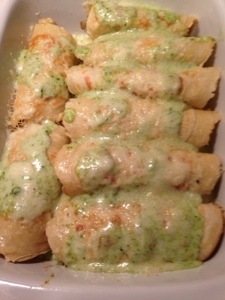 While the stuffed crepes were in the oven, I worked on the final component: the garnish. In a large skillet, I sautéed some sweet corn with the rest of the poblanos (chopped) in some olive oil with salt and pepper until they were heated through. I also prepped some cilantro and fresh lime as a garnish. 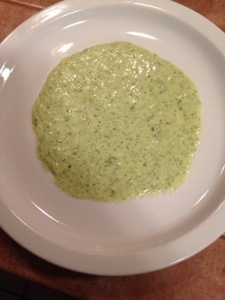 When the crepes came out of the oven, I spooned some additional poblano cream sauce onto the serving dish. 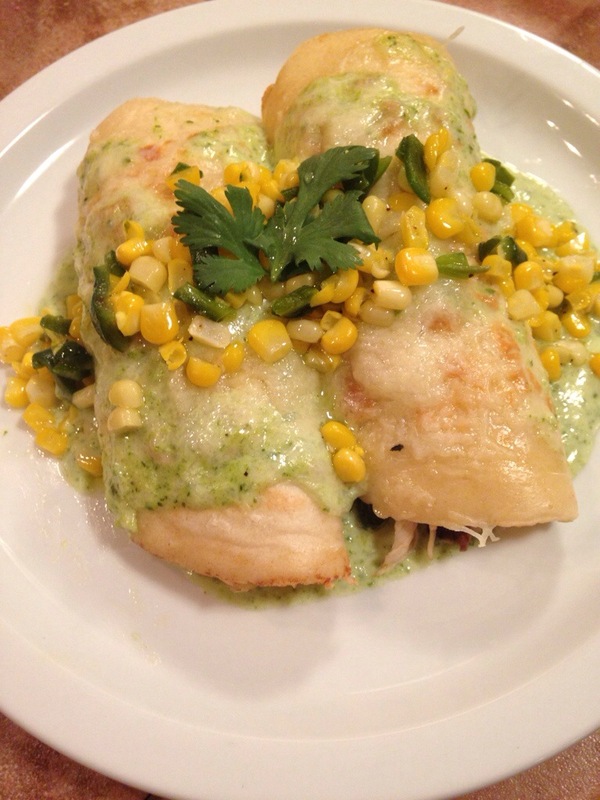 Then, I placed 2 stuffed crepes over the sauce and garnished the dish with fresh cilantro, the corn-poblano mixture and a squirt of fresh lime over the top. Overall, this dish was delightful. It was very unique and would have definitely caught the attention of the judges. While the crepes took a great deal of time (and probably should have been a bit thinner), the rest of the components were fairly simple. In the future, I might use pre-made crepes or flour tortillas instead in order to cut out a lot of the prep work. 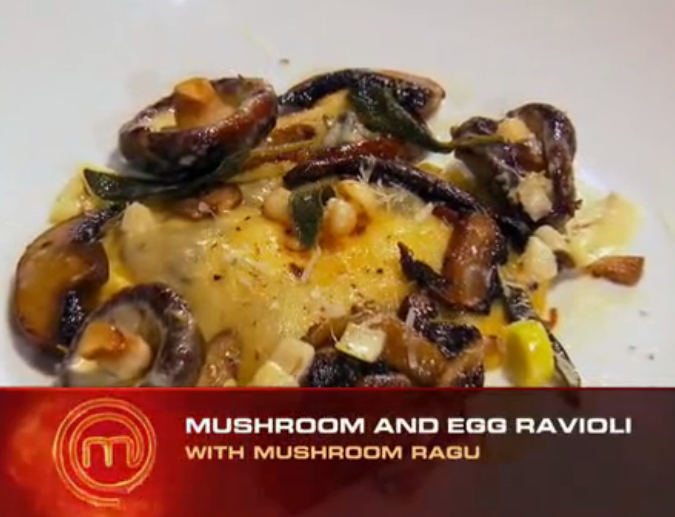 The flavor profile also didn’t feature mushrooms as prominently as the challenge called for, but I’m sure there’s a way to tweak this dish to do so. Regardless, this a delicious dish that should definitely be tried. I am certainly happy to be back to blogging. Here’s to hoping there won’t be too many delays like this in the future. 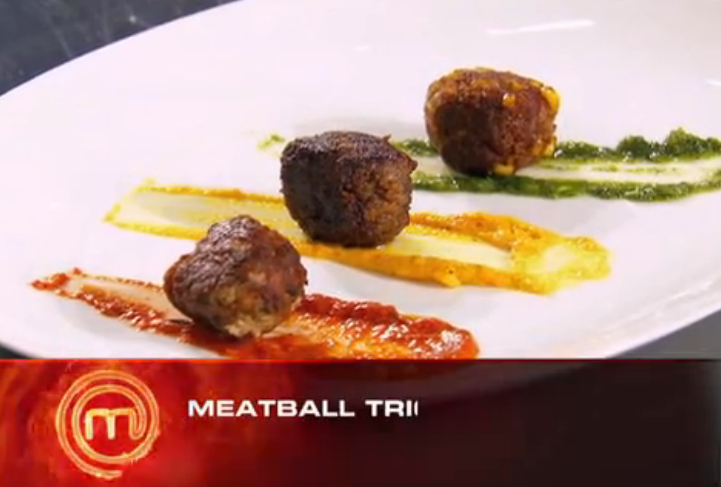 This week’s mystery box gave the contestants three types of ground meat to build a dish around: ground veal, ground pork, and ground beef. The mystery box also included: celery, corn, carrots, peas, mushrooms, lemon, tomato, bell peppers, garlic, eggs, milk, potatoes, red onion, worcestershire sauce, rice, mango, tomato paste, several fresh herbs, 3-4 different types of cheeses (among others). 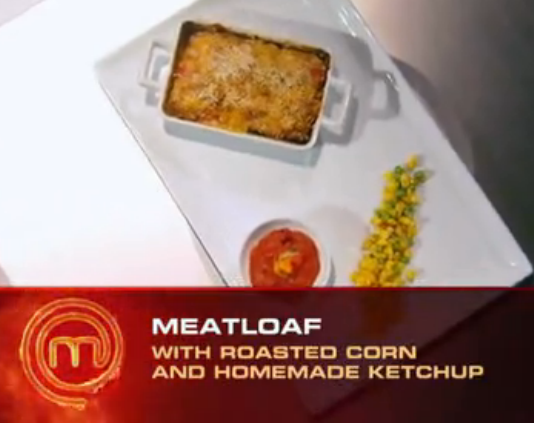 Jennifer (Meatloaf), Adrien (Trio of Meatballs) and Ben (Shepherd’s Pie) were named the top three with Ben winning the chance to pick the focus of the next elimination challenge. When I saw the ingredients available in this mystery box, I thought that I could put together one of my favorite dishes: stuffed peppers. I have never actually made these myself, mostly because my mom’s version is pretty well perfect and I didn’t want to create a poor impression. 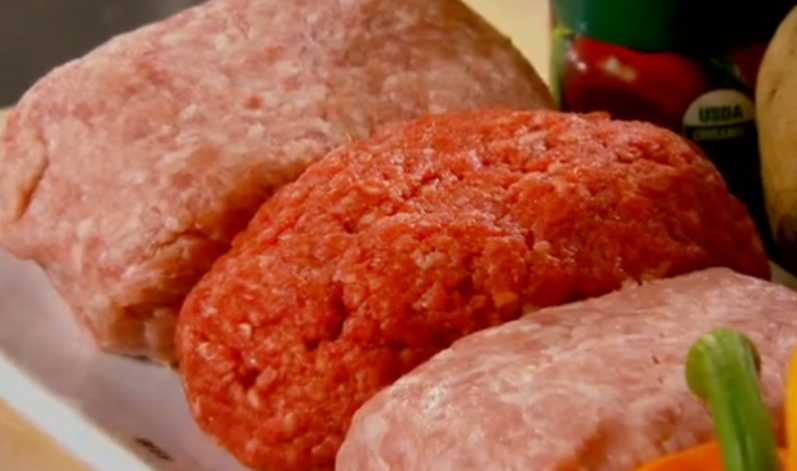 So I decided to find a recipe online that would be different enough to avoid the comparison. 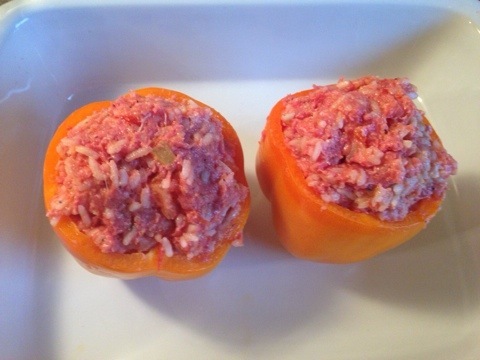 I settled on this as my guide: Stuffed Peppers with Ground Beef and Rice. I essentially stuck to the recipe, except for few minor changes and additions, mostly dealing with the tomato sauce. 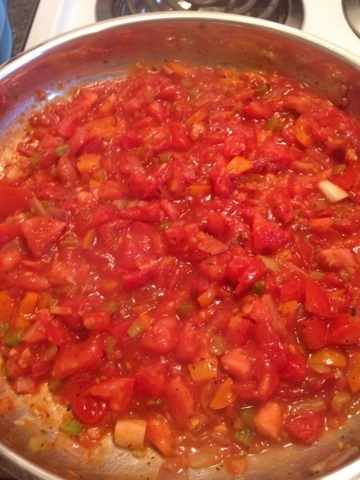 I substituted fresh vine-ripened tomatoes (which I diced) and tomato paste for the canned diced tomatoes and tomato sauce that the recipe called for. I also added 2 cloves of minced garlic and 1/2 of a banana pepper (minced) to the bell pepper, onion, and celery mixture. This made the sauce very chunky but it definitely added a lot of nice flavor. Everything else from the recipe was the same (including the sprinkling of shredded cheddar cheese towards the end of the cook time). Overall, the peppers turned out great but they were definitely not as good as my mom’s. (I’m going to have to ask her for her secret). I really wanted more tomato sauce throughout the beef mixture. When I make this in the future, I might put some sauce in the bottom of the pepper before adding the beef and rice mixture or maybe layer the sauce throughout. Either way, I will want more tomato flavor! 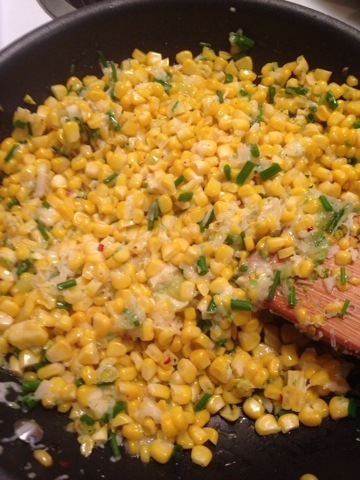 To serve as a side, I went for this recipe: Delicious Corn Dish Recipe. I saw this on buzzfeed a while ago and I have been waiting to work it into meal until now. I followed the recipe completely with just a couple exceptions. I had to substitute banana pepper for jalapeño because my grocery store was out. (This would be a good substitution for people that don’t like spicy foods though). 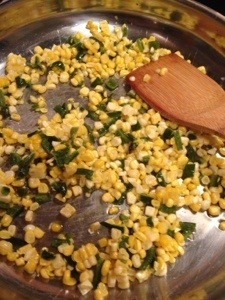 I also added some minced garlic to the corn when sautéing it in olive oil (because I have to add garlic to everything). Finally, I used equal parts of lemon and lime juice instead of just lime. 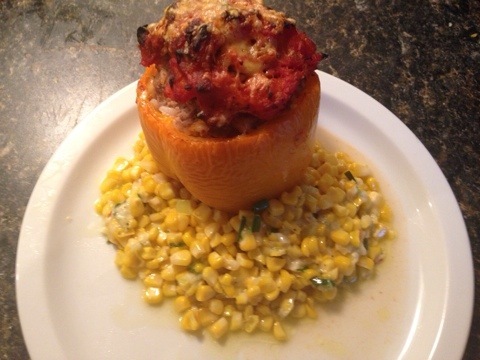 I served the stuffed pepper on a bed of the manchego-lime corn, making a very colorful plate. 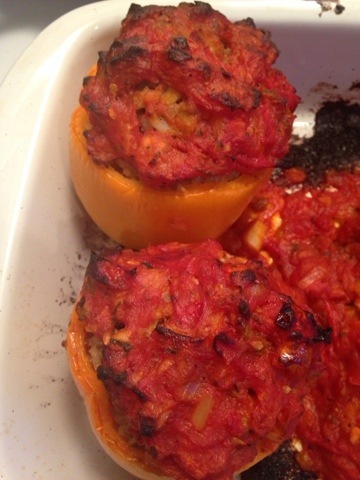 Overall, the corn and the stuffed pepper worked well together. It was a pretty solid dish but nothing super special. The corn was awesome though. I will definitely do that again. 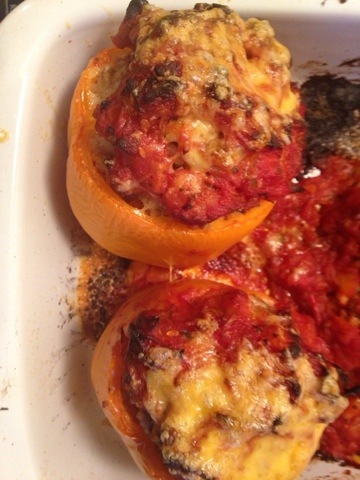 The stuffed pepper was just ok. It really needed some more flavor but maybe I’m just spoiled by my mom’s version. BONUS RECIPE: The same night I did the stuffed peppers and corn, I also decided to try my hand at some duck fat fries. I had some extra duck fat lying around from this blog post and I was really craving potatoes, so this was the perfect solution. 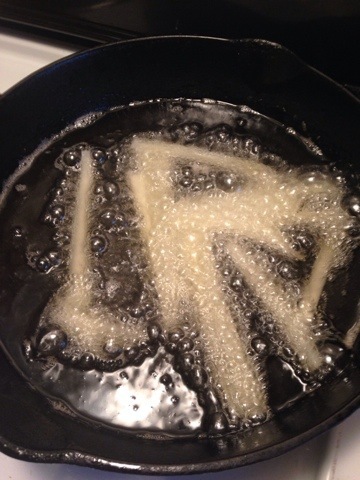 I found this tutorial: How to: Duck Fat Fries, and followed it completely (including the soaking and two-step frying processes). 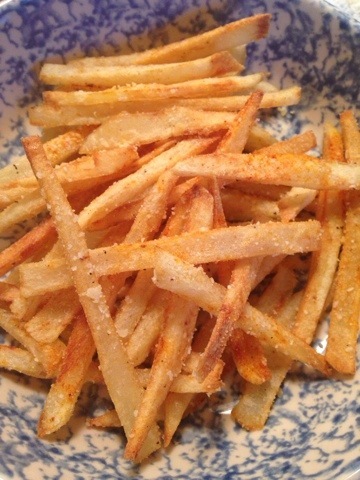 When they came out of the duck fat the second time, I seasoned them with truffle salt, paprika and grated parmesan cheese. And they were DELICIOUS!!! Seriously, far and away the best thing I that last night, and I can’t wait to make some more soon. 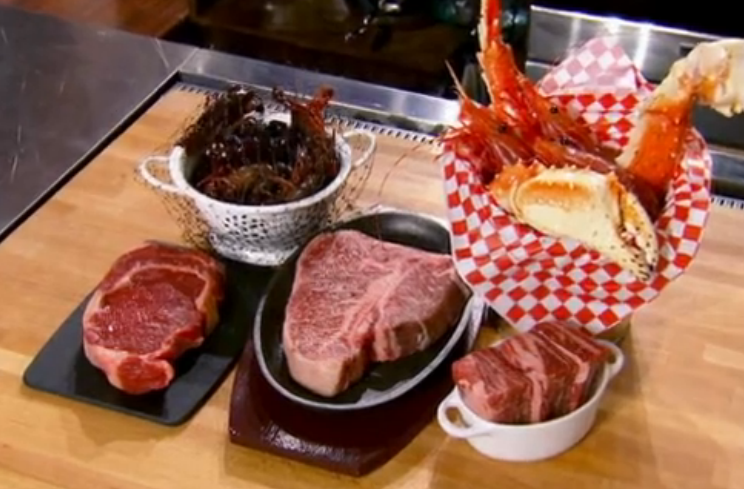 This week’s mystery box contained a surf and turf theme in which contestants were asked to create a dish showcasing beef and seafood with the following ingredients as options to incorporate into their dish: live jumbo shrimp, alaskan king crab, live crawfish, buffalo ribeye, dry-aged porterhouse steak, and short ribs. 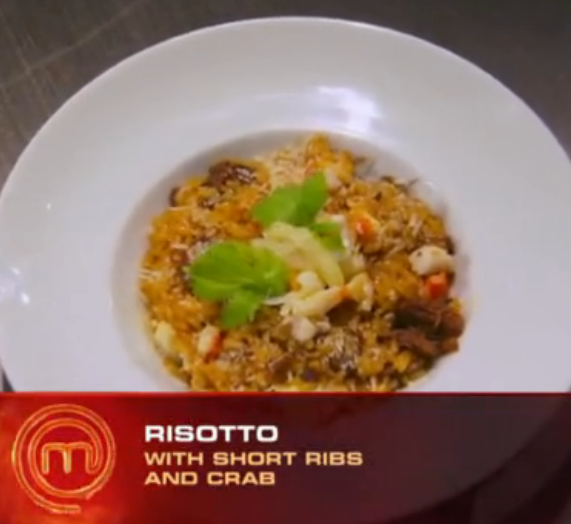 Adrien (Short Ribs and Crab Salad), Jennifer (Risotto with Short Ribs and Crab) and Suzy (Prawn Bisque and Bison) landed in the top 3 but it was Jennifer’s risotto dish that gave her the win and the advantage of getting to pick the dish for the next challenge. 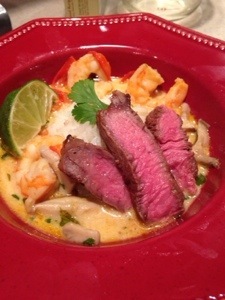 For this challenge, I immediately decided that I wanted to do some sort of Thai recipe featuring beef and shrimp. 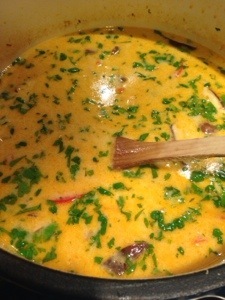 After some intense Google-ing, I settled on this recipe as my jumping off point: The Best Thai Coconut Soup. I also enlisted my brother, the Grill-Master, and my mother, the maker of the best shrimp I’ve ever had, for assistance in this culinary venture. 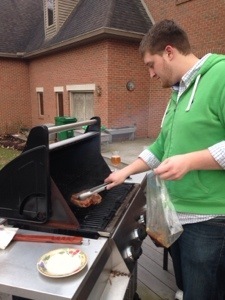 The first thing we did was create a marinade for the porterhouse steak. 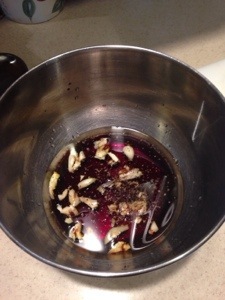 In a small bowl, we combined 3 tablespoons of soy sauce, 3 tablespoons of rice wine vinegar, 3 tablespoons of peanut oil, 2 tablespoons of fish sauce, 3 cloves of smashed garlic, and some cracked pepper. 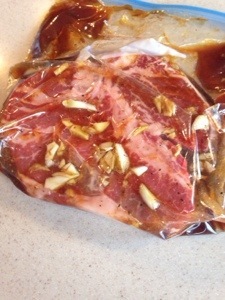 We put the marinade and steak in a large Ziploc bag and put it in the fridge for almost two hours. Then, I cooked the shrimp using my mother’s flawless instructions. 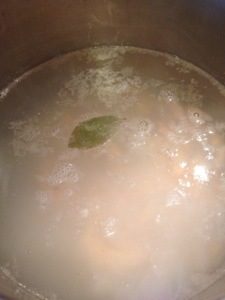 I brought a pot of salted water to a boil with a bay leaf in it. 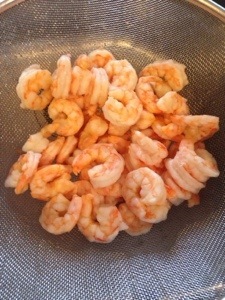 I then added 1 pound of frozen shrimp to the water and brought it back up to a foaming boil. (The foaming is the important part and this will take a while). After 1 full minute at the foaming boil, I removed the pot from the stove and drained the shrimp into a colander. Then, I rinsed the shrimp with cold water until the shrimp were cooled down to room temperature, and I let the shrimp stand in the colander until they were completely dry. 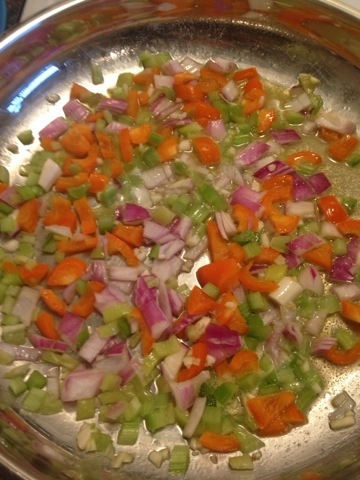 Next, I started on the soup. 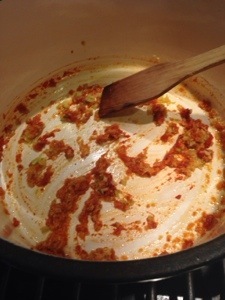 In a large pot, I cooked 1 tablespoon of olive oil, 2 tablespoons of fresh grated ginger, 1 stalk of lemongrass (minced), and 2 teaspoons of red curry paste for 1-2 minutes, stirring constantly. Then, I added in 4 cups of chicken stock, 3 tablespoons of fish sauce and 1 tablespoon of light brown sugar and let that simmer together for 15-20 minutes. 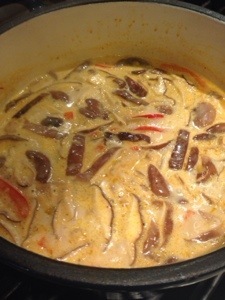 Then, I stirred in 3 cans (13.5 ounces each) of coconut milk, 8 ounces of sliced Shitake mushrooms, and a small red bell pepper (thinly sliced) to the broth. I let this all cook together while the rest of the components were finished up. 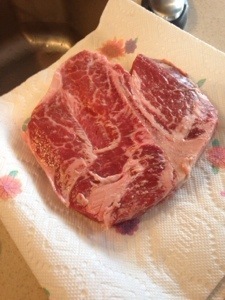 My brother grilled the steak for 5 minutes per side, taking it off when it reached 140 degrees. 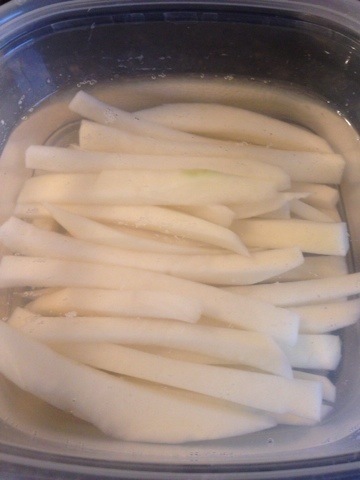 We let it rest for 5 minutes, and then I sliced it into thin strips for serving. 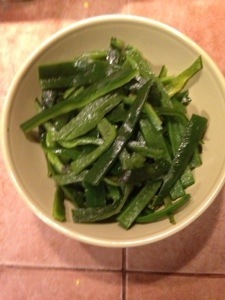 While he was grilling, I made the jasmine rice. 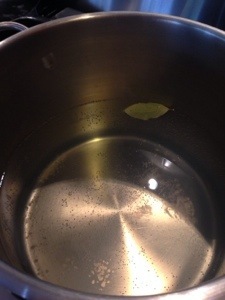 I brought 3 and 1/2 cups of water, 2 tablespoons of olive oil and 1 teaspoon of salt to a boil. 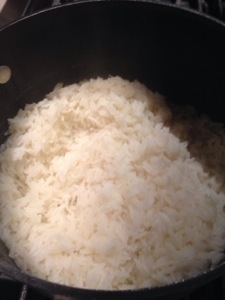 Then, I added 2 cups of jasmine rice, stirred and covered, and let simmer for 15 minutes on low heat. When all of the water was absorbed, I removed the rice from the heat and let stand for 5 minutes while covered until we were ready to plate. Finally, I took the soup off the heat and stirred in the fully cooked shrimp, 2 tablespoons of fresh lime juice, 1/4 cup of fresh cilantro (chopped), and several healthy pinches of salt (to taste). I plated the dish with a spoonful of rice in the middle with the soup surrounding it in the bottom of the bowl. I put three strips of steak over the rice, and garnished with a lime wedge and a cilantro leaf. This dish is definitely the prettiest plate of food I have ever made. 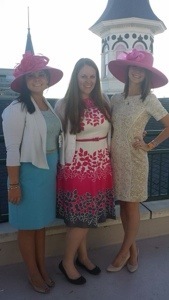 It was pretty darn delicious too. The flavors worked together wonderfully, and it was a very filling and unique meal. 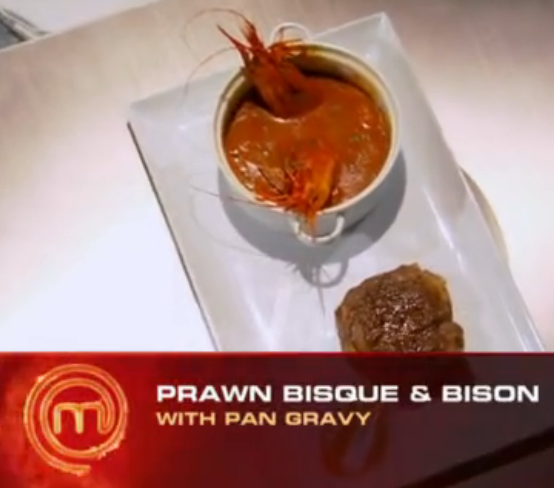 I definitely think that this dish would have been a contender in this challenge due to its creativity and great taste. And even though it requires some unique ingredients, this is a very simple recipe that I suggest you try for yourself. 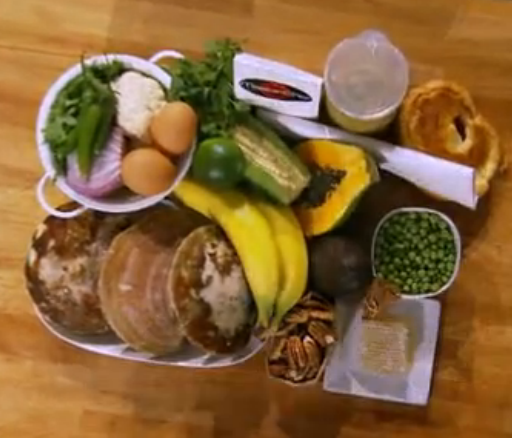 This week’s mystery box contained some hand-dived scallops along with the unique combination of bananas, papaya, peas, lime, jalapeño, red onion, eggs, a croissant, pecans, cauliflower, parmesan, avocado, corn, cilantro, arugula, cinnamon, pancetta, and brandy. 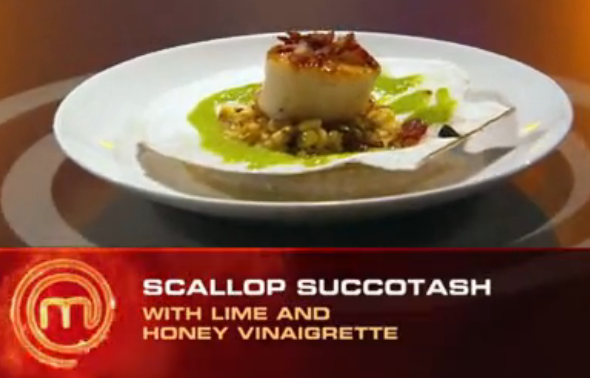 The top three consisted of Christian (Scallop Succotash), Adrien (Trio of Scallops) and Ben (Scallops and Bananas). 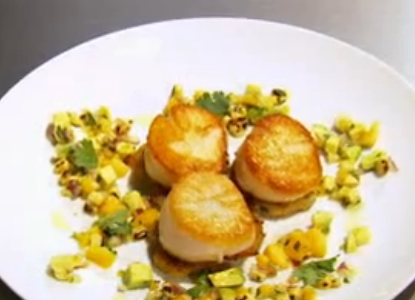 Adrien’s Trio of Scallops won over Ben’s risky combination of scallops and bananas. Mystery Box challenges are always my favorite. I really enjoy trying to find creative ways to incorporate as many of the ingredients as possible. And this was no different. 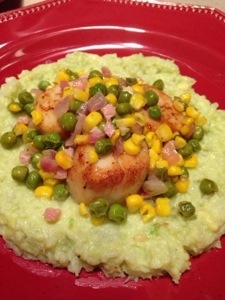 I decided to do just a classic seared scallop (by using the incomparable Chrissy Teigen’s Perfect Scallop tutorial as a guide, of course) with a cauliflower-avocado mash and mixed vegetables with pancetta. 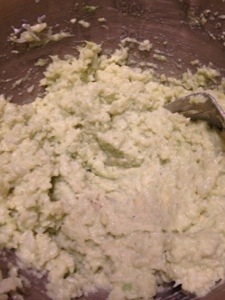 For the avocado and cauliflower mash, I used this recipe as a guide: Garlic Parmesan Avocado Cauliflower Mash. I stuck mostly to the recipe with the seasoning being the main exception. 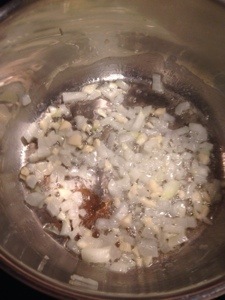 I steamed 4 cloves of garlic along with the cauliflower that I mashed up with it. I also used a decent amount of salt and pepper for flavor and thoroughly mashed the avocado up to give the whole component a nice light green color. 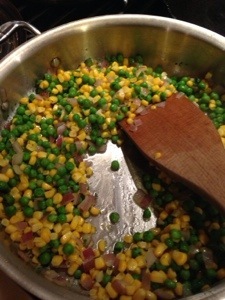 For the mixed vegetables, I first cooked the peas and corn separately. There were no fresh peas at the store so I had to simply steam the frozen variety in the microwave. 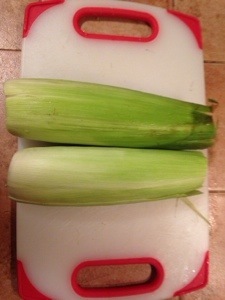 But I was able to get fresh corn, which I cut off the cob and boiled for a few minutes in salted water. I then sautéed 1/2 of a jalapeño (finely chopped), 3 cloves of garlic (minced), 1/4 of a red onion (chopped), and 10 cilantro leaves (finely chopped) in some olive oil, butter, and the juice of a lime. I wanted to put the pancetta into the mix at this time, but I forgot until later in the process because I was distracted but the numerous other components that were going on at the same time. But if you are doing this yourself, definitely put the pancetta in now. I cooked this together for a few minutes until the onions were translucent and then added in the corn and peas with some salt and pepper. This all cooked together for several minutes until the rest of the components were complete. I plated the dish with the avocado-cauliflower mash on the bottom, followed by the scallops and topped by the mixed vegetables with pancetta. Each component tasted good but I was disappointed with several things. 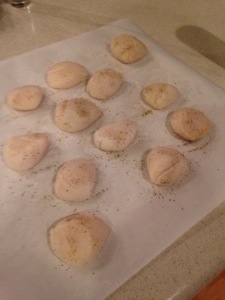 First, I was only able to get frozen scallops, and as much as I tried, I could not for the life of me get them dry enough. 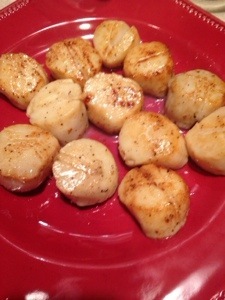 They did not sear very well as a result. Also, since I forgot the pancetta until the end, it did not give a lot of flavor to the vegetables and did not get crispy the way I wanted. 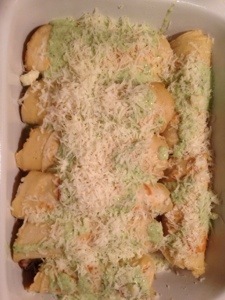 I think this dish has the potential to be very good but I executed poorly and didn’t have that great of ingredients. This is a fairly healthy and nice dish. I will definitely try this again but I will need to get more high-quality ingredients to make it worth it.